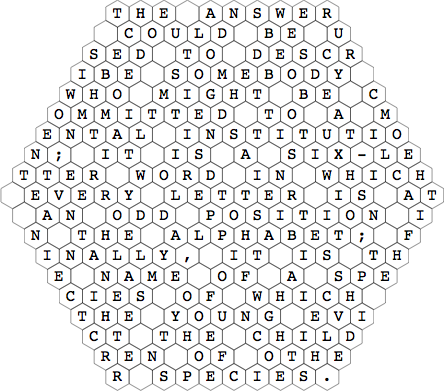 This puzzle is a hexagonal variation on the normal dropquote puzzle type. Spaces are not given in the grid; to compensate, letters are "dropped" in all three directions. Through a mixture of logic and word-recognition one fills in the grid as shown below. The clue phrase should make it fairly clear that the answer to the puzzle is CUCKOO.